April 2017 - Bring It! Driver Ed Lesson of the Day:Taking your shrimp show on the road. Driver’s Ed is taking me down. This is my second round of Driver’s Ed, the five weeks of captivity that will eventually lead to liberty. This time it is in St Johnsbury—again nowhere near where I live—so it involves lots of scheduling and shuttling of hungry kids. It can also involve a boatload of cash if you’re not careful. Whether it’s Driver’s Ed or spring sports turning your car into a food truck, this is the time to get your picnic on. One week in and I have already overworked my chicken rotation (oven fried chicken totally goes the distance).There is a tomato hater on board so the Panzanella of the Gods is out. I’m also not yet ready to surrender to the quick fix of pasta and meatballs, so I turned to a super easy, substantial and delish salad. This salad is a brilliant go-to for potlucks and picnics. It stars bulgur, which is sort of my new best friend. The beauty of bulgur is that it requires no cooking AND it’s cheap cheap cheap. Bulgur just needs to soak for a bit and it’s ready to use, making is a nice alternative to overnight oats…but that’s another meal and another conversation. We’re sticking with the picnic message here. What else makes this salad so great? It’s quick and easy to prep and pack, requires zero to minimal stove time and few ingredients, can be eaten at any temp and does leftovers like a boss. The spinach holds its own on Day 2, so even if you are an avowed leftover salad hater (helloooo entire rest of my family), this might entice you to change your ways. The recipe calls for cooked shrimp. I usually start with raw, defrosted shrimp, and cook them in a pan with some olive oil and/or butter, and a squeeze of lemon or a splash of vinegar. Do shrimp how you do shrimp. It’s all good. Grab that bag of shrimp from the freezer, soak some bulgur and make this salad. Then you’ll have all the time in the world to worry about having another driver in the house. This came from Food and Wine, but, as you can see in my notes nimbly veers to many variations. If you forget to get radishes you can go with any crisp, thinly sliced vegetable. No pine nuts? Use what you’ve got. Here, I used pecans. In a large bowl, whisk the lemon zest with the lemon juice and chopped dill. Whisk in the olive oil. Add the bulgur, shrimp, baby spinach, sliced radishes and pine nuts and toss to coat. Season with salt and pepper and serve. This entry was posted in Salads and Sides, Start it up and tagged blugur shrimp salad, picnic salad, road food, spinach shrimp salad on April 30, 2017 by Edie Morgan. A sign of the times, direct from the Jet Blue terminal in JFK. Unless you are living in, say, Narnia, you have likely noticed the Unicorn theme going on in the food world. There are rainbow-colored everythings, from cupcakes and cookies to noodles and sushi. 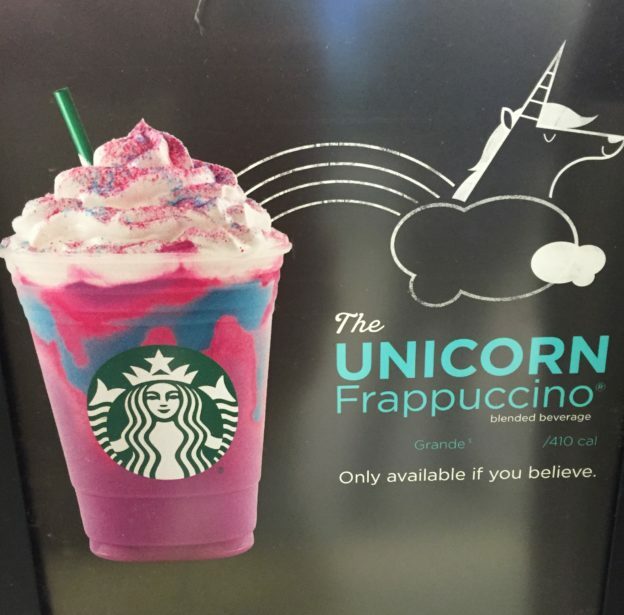 I know of one person who got on a waiting list for $60 rainbow bagels…that reportedly “tasted like dirt.” And now, to punctuate the moment, Starbucks comes out with the Unicorn Frappuccino, an unnaturally bright, pink-to-purple, sweet-to-tart-morphing frozen beverage. The unicorn food craze started out as a creatively wholesome pursuit, with unicorn toast. This is essentially cream cheese tinted with natural dyes from beet juice, freeze dried strawberry powder, turmeric root, chlorophyll, spirulina powder and freeze dried blueberry powder. Those little pots of fantasia, whimsically swirled on toast and garnished with star-cut vegetables, was innocent enough. Then Pinterest took over and things took a decidedly unnatural turn. The trend must say something about a need for escapism (I am the Unicorn of Your Confidence, after all), or about the number of people on Pinterest with too much time on their hands. Whatever nefarious marketing ploy may be at the heart of this trend, one must concede that, throughout picnic season at least, rainbow colored food is a legit thing. If you want to bring your A Game to the table, you need to have unicorn food technology in your skill set. A far safer, healthier, cheaper and more educational starting point—than ponying up $5 for 420 calories and 59 grams of sugar (the equivalent of 6 Krispy Kreme donuts and 22 Weight Watcher Points) for a Uni Frapp—are unicorn noodles. The basic recipe involves little expense and no fancy ingredients or techniques. As a bonus they involve a little bit of science. This is not Mentos in Diet Coke explosion excitement science, but acid (lemon juice) meets anthocyanin (cabbage mojo) color-changing science. All you need to be trendy is some red cabbage, some lemon juice, and some clear rice noodles. (If you crave another white carb, make rainbow rice as featured in this unicorn sushi.) Once you have made the noodles, the challenge is finding something appealing to put on them. Peanut sauce? Not so pretty. Marinara? No grazie. Considering the lemon juice already at work, I went with olive oil, capers, parsley, salt and grated parmesan cheese (thank you Patti G!). Really any blanched or grated vegetables would work. Indigo Kitchen goes full Yellow Brick Road Technicolor and plates the noodles with every fresh vegetable and fun sauce on the planet, like this and this. I feel healthier and kind of magical just looking at these creations. So here is the basic recipe, tightened up from Indigo Kitchen. If nothing else, just bring it to a friend’s house as a conversation starter. I mean really…unicorn side at the pot luck—you win! Boil some water (enough to hold the amount of noodles you want) with the red cabbage. The amount of water used and the time you soak the noodles will affect the shade of blue your noodles will be. Less water/longer steep time= deeper color. Turn off the heat and add the noodles. You can use basic white or clear noodles, but glass/clear noodles will get you the prettiest shade. Let the noodles soak for about 5 to 10 minutes, depending on how deep you want the color to be. Remove the noodles and place them in a bowl. Here comes the magic, and the chemistry lesson. Take a lime or lemon and squeeze some of the juice wherever you want it to be pink. Watch the noodles change color in front of your eyes. Hint: Bring the kids in here. Be a hero. Purple cabbage has a pigment called anthocyanin, that changes color when it makes contact with something acidic or alkaline. When you cook a few pieces of purple cabbage for a short time in some water you’ll get a nice blue shade. Cook it for bit longer with a bit more purple cabbage for a nice purple shade. Add something acidic (lemon or lime juice) to the blue colored noodles and the pigment from the purple cabbage will react and take on a bright pink color. It really happens. Try it! If you are not impressed, there’s always Starbucks. Passing the Nina test. She is too nice to squawk. Turmeric joins the party, lending yellow flair in unicorn land. This entry was posted in Salads and Sides, Uncategorized and tagged noodles, rainbow food, unicorn frappuccino, unicorn noodles on April 22, 2017 by Edie Morgan.